In solidarity with those affected by President Donald Trump’s executive order which puts a 90-day travel ban on several Muslim-majority countries, and suspends the United States’ refugee system for 120 days. 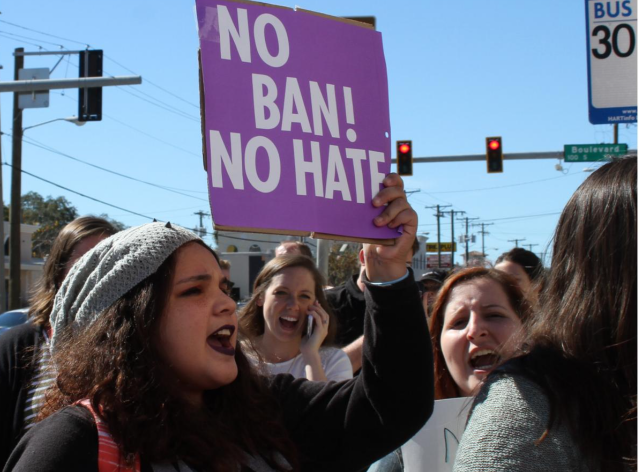 Students, faculty, and a few people from outside UT met on the corner of North Boulevard and Kennedy Boulevard on Jan. 31 to protest. The executive order came as a response to acts of terrorism tied to Muslim extremists. It bars individuals from Iraq, Iran, Libya, Somalia, Sudan, Syria and Yemen from traveling to the U.S., regardless of visa category. Green-card holders traveling from any of the countries are subject to additional screening at airports, said White House Chief of Staff Reince Priebus, in an interview with Chuck Todd on Meet the Press. Syrian refugees are banned indefinitely. The protest leader, Casey Bauer, a sophomore political science major, said he was motivated to create the protest by department chair and Associate Professor of Political Science Mary Anderson. Anderson is a child of immigrants; her mother came from Ireland in 1960 and her father came from Italy in 1970. Anderson then talked with Bauer, who was inspired to start the protest on campus. There are seven students currently enrolled at UT who hold visas from the seven named countries. The university has already reached out to offer them support. “The UT community is enriched by our diversity on campus and values the free exchange of ideas and experiences between members of all backgrounds and nationalities within our community,” said David S. Stern, the Provost, and Ronald L. Vaughn, President of UT in a statement released via email to the school. Ziyad Ashukri, a graduate finance student, is from Libya and has been studying here on a student visa since April 2015. “[The travel ban] affected me personally; my mom and dad were coming for Spring break and they’re not anymore,” said Ashukri. Ashukri’s parents are currently living in Egypt, but are still citizens of Libya. When they heard about the executive order, they knew they wouldn’t be able to travel to the U.S.
Ashukri, like many affected by the ban, is a muslim, and came here to enrich his education by getting his master’s degree here at UT and follow the American dream. Similar to Ashukri, some UT protesters held the belief that everyone was an immigrant to the United States, at one point or another. Cann Hamilton is referencing the ongoing crisis in Syria. Since 2011, the country has been in a Civil War that has displaced its people, especially citizens of Aleppo. Many protesters found Trump’s executive order to be against America’s founding principles. Protesters like Cameron Moskol, a junior sociology major, felt it was their civic duty to speak up. The protest received media coverage from Channel 8 and was aired on the five o’clock news. Toward the end of the protest, Trump supporters arrived with a banner to share their views as well. President of College Republicans Danny Driscoll was unaware of the protest until he saw it when he was walking back from class. Driscoll said that although he didn’t agree with the protesters, he admired them for their compassion toward the UT students affected by the executive order. For the 90 days that the executive order remains in place, students in the UT community will continue to feel its effect. Many of the protesters, including Bauer, were impressed by the number of students who attended the protest.